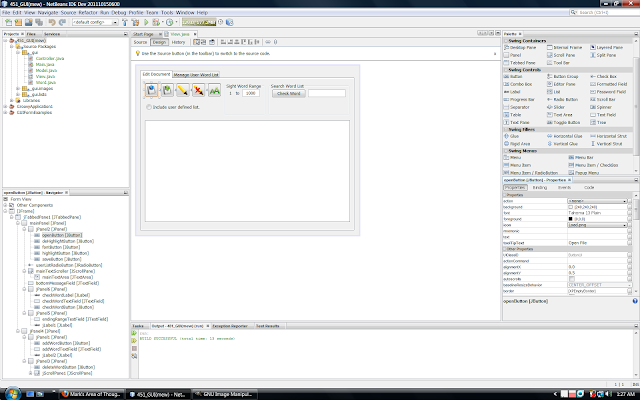 NetBeans IDE 7.1 will be a very nice release with JavaFX 2.0 support. The Swing GUI Builder is getting a heavy thrashing to iron out some of the bugs that have been plaguing it for a while. It seems many people have complained about the GUI Builder crashing and things jumping out of place, but not many of them have been submitting reproducible test cases for the developers too pin down where the bugs are. I am currently active within NetCAT 7.1 and I have been hammering the GUI Builder to squeeze out all the bugs I can find. The developers have been readily fixing the bugs at a quick pace. I hope these fixes all make it to the release candidate I will be testing in a few weeks. I find it exciting that there is an easy to use, free IDE available for Java and I can make a Java application that runs in Windows and looks and feels just like other Windows applications. Java has come a long way in speed and runs quickly on Windows. Previous versions, many years ago, were noticeably slower when running GUI applications on Windows, but now there is no difference. NetBeans is not only an IDE, NetBeans itself is a development platform that is free to use for quickly developing your own applications. There are many companies using the NetBeans Platform as a framework to develop all sorts of special desktop applications.